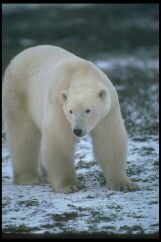 A huge bear with an unmistakable creamy-white coat, the polar bear is surprisingly fast and can easily outrun a caribou over a short distance. It wanders over a larger area than any other bear and, of course, swims well. 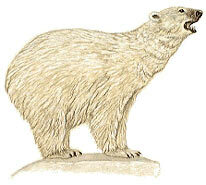 Seals, fish, seabirds, arctic hares, caribou, and musk oxen are the polar bear's main prey, and in the summer it also eats berries and leaves of tundra plants. 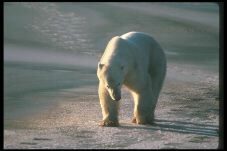 Normally solitary animals outside the breeding season, polar bears mate in midsummer. A litter of 1 to 4 young is born after a gestation of about 9 months, and the young bears remain with their mother for about a year. Thus females breed only every other year.